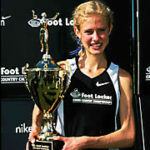 California junior Claudia Lane from Malibu easily ran away from the field at the Foot Locker National Championships December 9th at Balboa Park in San Diego winning in 17:03.4. 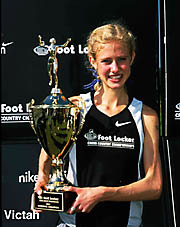 Lane won last year in 17:04.8 and will attempt to be the first three time winner next year. Tiny little Redwood Empire has had an amazing history at these National Championships. 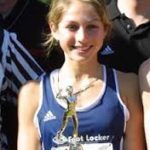 We have actually had two girls in the top seven twice before besides winning three different years and having two of the fastest four time ever..
1981    16:40   Connie Robinson                         Cincinnati      OH      Orlando, FL, different course from 2000. 1994    16:41   Julia Stamps     10     Santa Rosa      Santa Rosa      CA      San Diego, CA, missed CR by 2 seconds. 2000    16:55   Sara Bei         12     Montgomery      Santa Rosa      CA      Orlando, FL, set CR that Trotter broke.